Xavier ‘X’ Cooper played from 2012-2014 for the Washington State Huskies. He finished his 3 year career with 122 total tackles, 32.5 for loss, 13 sacks, and 2 fumble recoveries. X improved his draft stock by leading all defensive linement with a 4.86 40. He’d be taken in the 3rd round of the 2015 NFL Draft by Cleveland. Since that time Cooper has provided rotational depth on the Browns defense posting 39 combined tackles and 1.5 sacks over the past two seasons. Like with many Sage 2015, I liked the portraiture of the set, but was disappointed ultimately by how the black obscured the autograph. 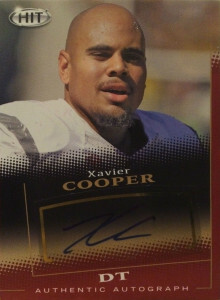 It doesn’t really matter on this one as Cooper has a very pedestrian looking autograph.